AURORA V was launched in April 1969 at the Annapolis Yard of John Trumpy & Sons on Spa Creek, MD. 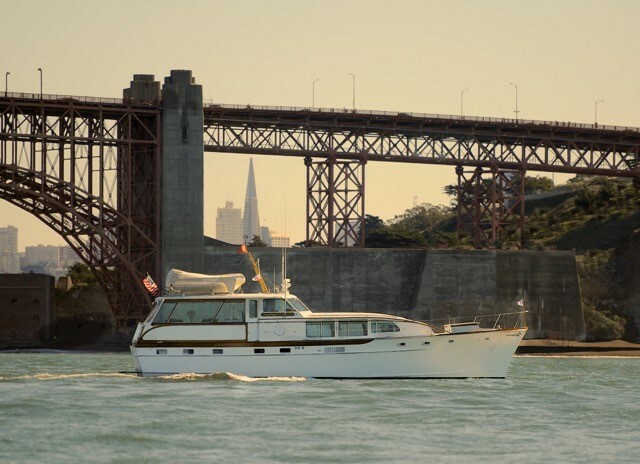 This 58' doubled-planked mahogany Coastal Cruiser was designed and built as Trumpy’s next generation yacht to propel this 60 year old company into the future, just as fiberglass became the prevalent choice of hull material. Trumpy only built 6 to 8 yachts per year. The Trumpy Family since 1946 began building certain yachts for their own personal use and to serve as showrooms of their craftsmanship. These highly amenitized and designed yachts were named AURORA. Since 1946 there were six Aurora’s built (4 left today) with the last one, AURORA V, launched in 1969. John Trumpy Jr. personally oversaw the design of AURORA V in collaboration with Frederick C. Geiger, noted naval architect who since 1955 worked for Trumpy. Geiger introduced the cruiser design, adding to Trumpy’s yacht traditional “houseboat” lines. Geiger is well known since the late 1930’s for his sailboat designs. A February 1970 Motor Boating Magazine article stated “John Trumpy can often be found aboard his own AURORA V, as she sails down the Severn River outward bound for coastwise cruising”. 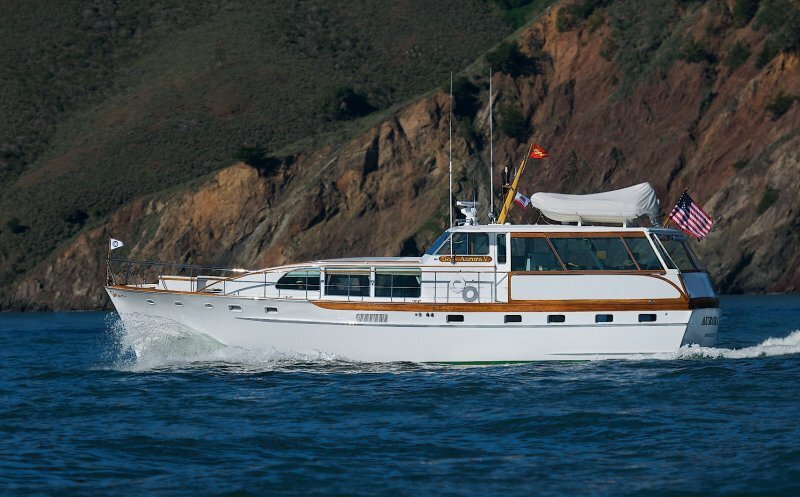 John Trumpy Jr. closed the company down in 1973 due to a labor dispute, yard fire, growing disinterest for wood hull yachts, and Trumpy’s refusal to construct hulls with fiberglass instead of wood. In late 1972, the AURORA V was sold and since owned by a number of owners until 1996 when she fell into disrepair. She was refitted and re-powered in 1996/97, re-fastened below the waterline with half of her white-oak ribs forward of the engine room sistered, and the house refitted. The original twin Cummins engines were replaced with Lugger diesels. The only additions since new are the aft deck enclosure (by Trumpy), bow rail (1997 refit), and tender hoist (1997 refit). In 2001, AURORA V was sold and piloted under her own power from Tampa, FL to Houston, TX where she was loaded on a special-equipped flat car and railed to the Port of Long Beach, CA where she was re-launched. AURORA V resided in Newport Beach, CA for 11 years until she was donated to the Orange Coast College School of Navigation. In 2013, the current owner purchased AURORA V, and has completed extensive work to bring her to bristol condition. She is moored in San Francisco Bay.